Convoy Henshin! 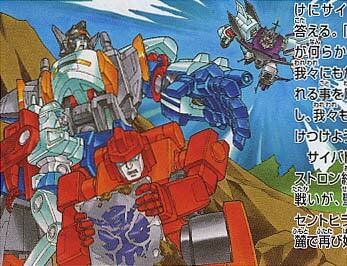 It’s the original 1984 Hasbro Transformers toys commercial but dubbed in Japanese by Takara for their market. Promo Trailer for the Japanese PlayStation 2 Video Game ‘The Transformers: Call of the Future’ (Transformers: Tatakai) developed by Winkysoft and released in 2003. Features some pretty fun G1 CGI cut scenes including fights between Convoy (Optimus Prime) and Megatron, as well as Rodimus and Galvatron. Looks fun! Too bad this never made it to the states. Please let us know if you’ve ever played this game and how it is! 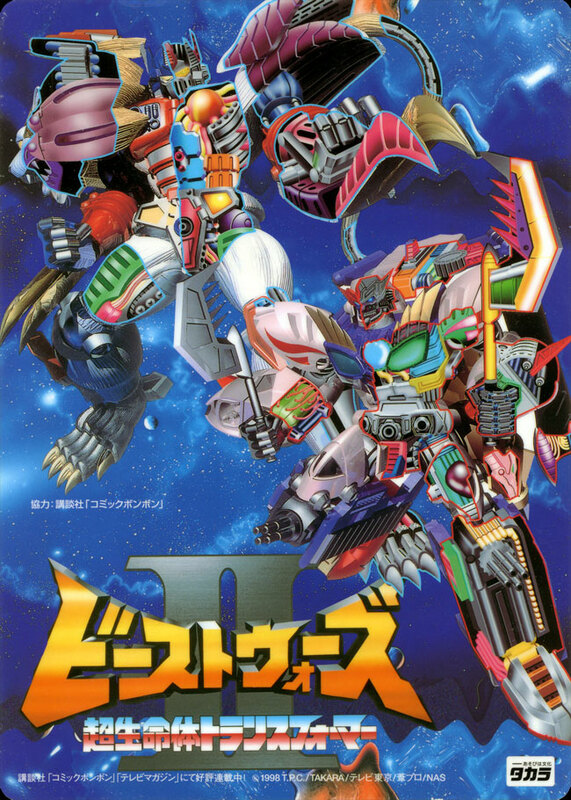 This Beast Wars II pencil board was released in Japan by Takara in 1998. The front of the board features art of Lio Convoy and Galvatron with some cool cross sections giving us a peek at their inner workings. 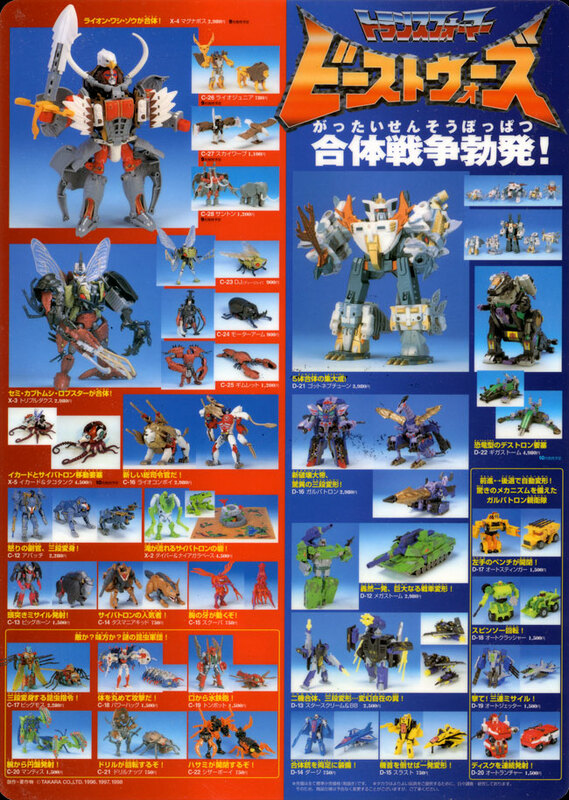 The photos and general design of the back of the board are recycled from the catalogs that were included with the Beast Wars II figures. 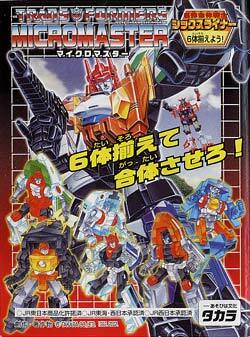 This official 1986 Takara Transformers Vs. set features Rodimus (C-77) Vs. Galvatron (D-62) and was only available in Japan. The figures are made of vinyl and are about 5″ high in height and feature articulation at the shoulders. 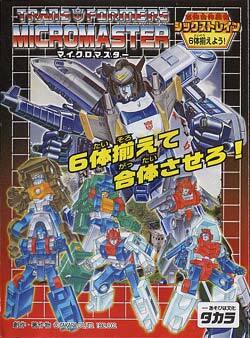 This Hot Rod kit was produced in Japan by MC Axis in 1996 and is officially licensed by Takara. The kit is unpainted and includes alternate heads, hands and accessories highlighting key Hot Rod scenes from Transformers: The Movie. The kit also includes a pack-in comic. 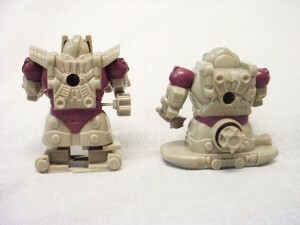 Similar kits were also produced by MC Axis for Arcee and Elita One. If you have the Autobot set, please contact us and let us know! 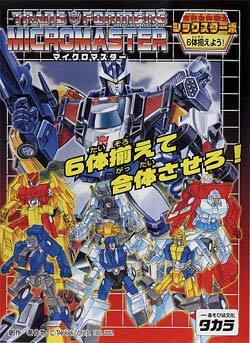 In 2002 Takara announced and released a special ‘Micromasters’ branded reissue line. 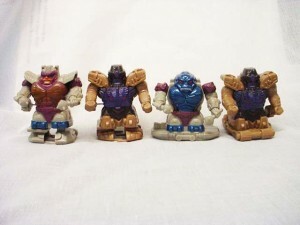 The Micromaster reissues focused on the Micromaster Combiner teams, last seen in the early 90s. The reissues were largely the same as the originals with the biggest change being that what were once decals, were now tampographs. The series featured 6 releases total (11 when counting the ‘chase’ variant versions) and ran through 2003. 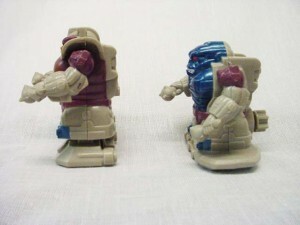 For each release, the individual figures that make up the Micromaster Combiner were packaged and sold separately in generic boxes with a small identifier specifying which figure was inside. 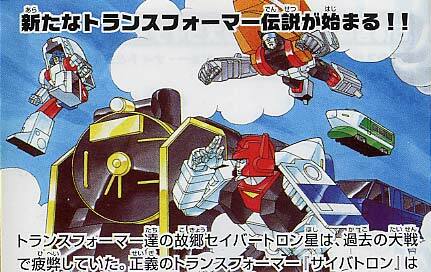 Each Micromaster Combiner (except Sixliner) also featured a variant ‘chase’ set recolored in a unified theme. 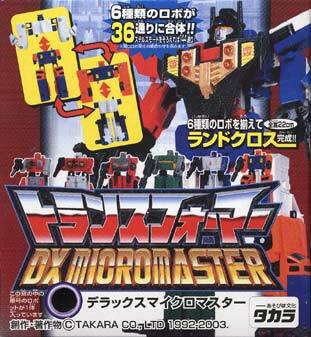 The final release in the series was a reissue of Landcross, the Multiforce team from Takara’s ‘Victory’, marketed as a ‘Micromaster DX’. As always, Takara went the extra mile for this special line of reissues and created an original over-arching story and updated bios for each release. The story featured accompanying full-color original art and also managed to work in an explanation for the ‘chase’ versions. 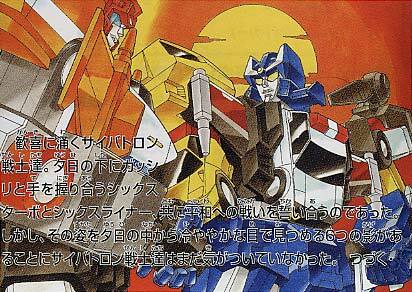 With each new Combiner reissue, a new part of the story was printed on the back of the instruction inserts telling the tale… in Japanese. 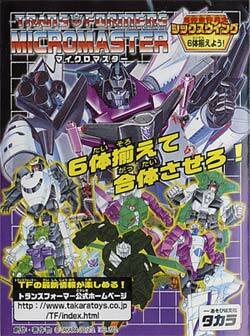 Special thanks to Doug Dlin for taking the time to translate the Micromaster instruction sheets for all to enjoy. Pt. 1: Sixliner – A NEW TRANSFORMER LEGEND BEGINS!! The Transformers’ home world of Seibertron had been exhausted by the Great Wars of their past. 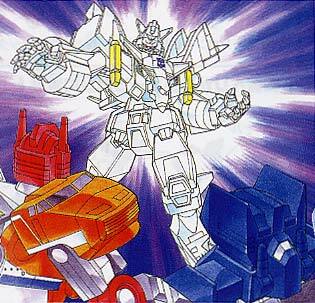 In the course of the wars, the good Transformers, known as the Cybertrons, lost both the Matrix, which was the amassment of their wisdom, and their leader, Convoy. 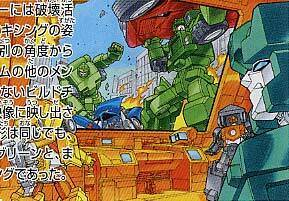 However, after the Great Wars ended, a number of Seiberdroids (Seibertronians without the ability to transform) confirmed that Convoy had escaped into outer space in combat. 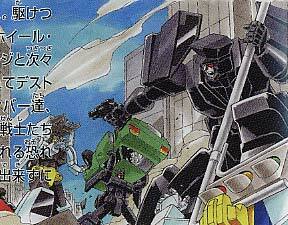 They planned to seek out the Matrix and Convoy, both to restore their world and for the sake of the Cybertrons. Organizing an exploration fleet, they journeyed into space, following the traces of the Matrix. During their investigative travels, an accident sent a dimensional shockwave washing over the Seiberdroids, and they were teleported to a remote area of the galaxy, where they crash-landed on the third planet of our solar system. 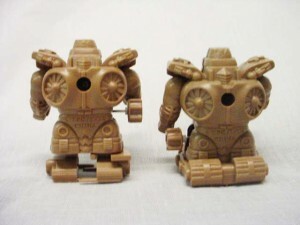 The damage to their ship left them with no means to contact or return to Seibertron, but the dimensional vibrations also evolved the Seiberdroids so they gained the ability to transform. 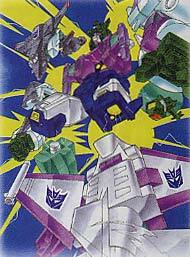 This was the birth of the Transformer Micromasters. 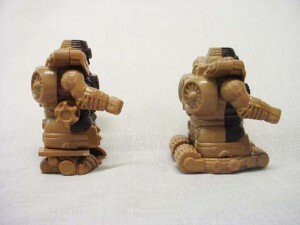 In rapid succession, the Seiberdroids began transforming into Earthly vehicles, but as a side effect of the evolution, evil minds emerged in some of them, who evolved into the evil Transformers known as Destrons. 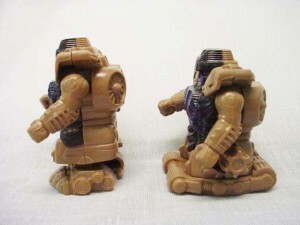 Gradually, Micromasters were divided into two forces. A new battle began between the Destrons, who plotted to conquer the Earth and return home to Seibertron, and the Cybertrons, who wanted to co-exist with Humanity, set their sights on the cosmos with them, and continue their search for the Matrix. Pt. 2: Sixturbo – ENTER THE URBAN DISASTER RELIEF SPECIALISTS!! 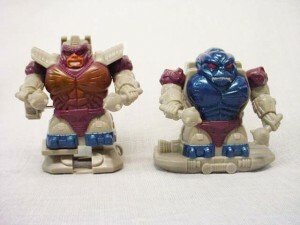 In the course of their evolution, the Micromasters who crashed on Earth divided into heroic Cybertrons and evil Destrons and began to war among themselves. Using a part of their crashed spaceship as a base, the Cybertron warriors resolved to stay on Earth until there was some hope of returning to their home world of Seibertron. Wishing to co-exist with the people of Earth, the Cybertron forces made the best of their ability to transform and take action around the globe in order to smooth communication with human society. Like the Liner Team, the members of the Turbo Team participated and blended into human society. Already a group of specialists in urban disaster relief, when faced with even greater disasters, the Turbo Team combined and went into action as Sixturbo and faced squarely against Destron assaults. One day, the evil manipulators of the Destrons reached out for Road Police while he was patrolling the highways. Using a mind-changer virus, they reverse-evolved him into a Destron, and Road Police began destroying the city. Circuit, Neo-Wheel, Glide and Discharge came charging in, but one by one, the other members were also infected and became Destrons. The deployed Cybertrons could only stand idly by, unable to approach lest they also become infected. At Digo’s instructions, Sireen arrived after completing work with Joe on the development of a vaccine program. However, the vaccine program required a direct connection and installation time to be installed. Ino order to minimize the infection damager, it was necessariy to install the vaccine into all five members at the same time. Having worked out a plan, Sireen approached to bargain with the Destronized warriors. “What say I join you as a Destron and we become the ultimate fused fighter.” Having thus goaded them into combining, his strategy was to install the vaccine at the same time as they merged. As Sixturbo began to combine, Sireen struggled desperately, the virus flowing through his body. Just when it was thought that Sixturbo was totally Destronized, he regained his Cybertron self through the vaccine program. The Cybertrons’ strategy had succeeded. Joy welled up among the Cybertrons. Sharing a firm handclasp under the setting sun, Sixturbo and Sixliner vowed to each other to fight together for peace. However, the Cybertrons had not yet noticed six shadows in the sunset, gazing at them with cold optics. Pt. 3: ENTER THE DESTRON SIXWING!! Deep in the night, the shadow of a plane neared the Cybertron base unnoticed. Using his stealth abilities to their fullest, Missile Run of the SixWing team was attempting to infiltrate the base. Cutting his engines, Missile Run silently glided in to a landing. Shifting to robot mode, he eluded the automatic surveillance network and succeeded in sneaking inside. Confirming there was no one watching the passageway, Missile Run infiltrated even deeper into the base. His goal was to capture the Cybertron capsules sleeping in compressed storage. Not all the Seiberdroids who had crashed on Earth had evolved into Micromasters. The Seiberdroids who were in compressed hibernation still remained asleep, not yet given a vehicle into which to evolve. This measure had been taken based on a decision by Diego and the other Cybertron warriors, who had no wish to increase the number of teammates who might be evolved into Destrons. The instant Missile Run reached for the capsules, a piercing alarm rang out, and he found himself held at gunpoint by Road Police, who was first to charge in. “Hold up!” Road Police cried out, bringing Missile Run to a halt. “You think we’d pass up a chance to make more friends?” Missile Run snapped sarcastically. Then he snapped his fingers, and the wall behind Road Police blew apart with a roar, the result of a pinpoint attack by the Destron soldier Raker. Missile Run made good his escape, and the pursuing Cybertron warriors found themselves faceplate to faceplate with the Destron Wing Team. “The operation has failed,” Chaingun’s furious shout echoed. “Destroy everything! Combine! !” And at his command, they did just that, forming SixWing. As SixWing flew freely through the air and attacked, the Cybertrons found themselves faced with a difficult fight. “Well, we’ll just combine too,” SixTurbo said, entering the fray, but he also found himself hard pressed by a foe who could transform at will while attacking from the sky. “Help’s on the way!” SixLiner said, arriving to back him up. In his hand, he clutched a modified Vaccine Program Gun. (This was a modification of the program that saved the reverse-evolved SixTurbo. Sireen had developed it in the hope that it might reverse-evolve Destrons into Cybertrons.) “Bullseye!” SixLiner scored a direct hit on SixWing. As SixWing suffered in pain, his body began to turn white. “Just the opposite of what happened to ‘Turbo,” SixLiner rejoiced in his success. Reborn in mid-air into a pure white body, SixWing now sported a Cybertron emblem gleaming on his chest. “Welcome back, CYBERTRON warrior SixWing,” SixTurbo said, extending his hand. Pt. 4: SIXBUILDER–WARRIOR OF MISFORTUNE!? The appearance of Berserker SixWing had resulted in a strong sense of impending crisis among the Cybertron Micromasters, casting sizable doubts upon their pride as Cybertron warriors. Compelled to suffer endlessly repeated attacks by the Destron forces, many of them were injured, and sometimes they were even robbed of their Seiberdroid Capsules. As the balance of power began to crumble, there awakened a power to turn things around. This was the debut of SixBuilder!! One moonless night, the Cybertrons somehow managed to drive off a Destron night assault, but a portion of the Seiberdroid Capsules they’d successfully protected had received shocks in the battle and thawed out, and once more Micromasters wakened. 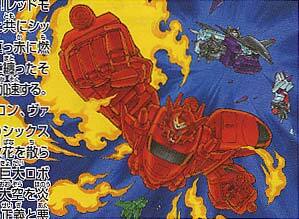 The six warriors took on the forms of Earthly construction vehicles, and thus the Build Team was born. Their combat strength rivaled even Beserker SixWing’s, and their high level of technological skill showed a remarkable impact on everything from repairing their comrades to reinforcing their base. 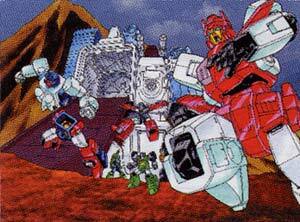 On one such day, word arrived at the Cybertron base that the Destrons were on a mission of destruction in the city. Glide and Road Police charged onto the scene, but the Destrons had already retreated, after which the pair discovered from testimony by the local residents that there was a high probability it was a new Destron offensive force. Upon returning to base and analyzing the information, they found the local citizens had recorded some startling images. Diego and the others called in the Build Team and pressed for a confirmation in front of the monitor: “There’s some images we want you to see.” Displayed on the monitor were Treader and Mixing engaged in acts of destruction. Images taken from different angles showed the other Build Team members doing the same…. The Build Team could not conceal the astonishment on their faces. However, while their projected selves were the same in form, they were totally different in color, with bodies of light green hue. Then Diego spoke: “For the moment, it doesn’t appear to be a plan to introduce fakes, but we can’t read the Destrons’ intentions. You should all exercise plenty of caution.” After he’d finished and the Build Team had moved to another room, their eyes met and they nodded to one another. At length, the Build Team found the fakes(?) with a stakeout strategy, but could not hide their bewilderment at the enemies’ total copying of their appearances. Their minds made up, the Build Team combined, and thus SixBuilder appeared. Pt. 5: SIXTRAIN! ACTIVATE RED MODE!! “I wonder if the Destrons’ plan was to make this dormant volcano erupt?” Discharge worried, appropos of a firetruck. “So, let’s take over the excavation, then,” said Digger, his shovel biting into the earth… The unearthing proceeded favorably, and an ancient secret was soon to be revealed. “Convertor, sir! I think we’ve finally found something…” Raise’s voice echoed out, as if to put a stop to Gran-Arm’s grumbling. “Something’s there!” Raise’s special ability was providing guarantees. What they’d uncovered were two pieces of metal. “This one resembles the type of metal generally used in the outer hulls of spaceships on our own world of Cybertron,” came Crushbull’s analysis. Painted on the other piece was an eerie, purple mark resembling an insect’s head. “Judging by the dating of the stratum, it would seem our companions arrived on this world about three million years ago…” The sound of an explosion cut short Desire’s guesswork, and the Destron Wing Team came flying in along with it. “Good job digging!” Chaingun yelled. “Now we’ll just be taking that unburied treasure!” SixWing combined. “Return fire. Build Team, protect the ruins. Train Team, combine!” SixTrain merged at Desire’s command, and the battle was on!! The endless war between Cybertron and Destron has begun once again at the base of the sacred peak, Mount St. Hillary. Pt. 6: THE MENACE OF LANDCROSS’ COMBINING FORMATION! Today, the battle between the Cybertron and Destron Micromasters has repeated itself again, but the discovery of the ruins at Mount St. Hillary has changed the state of the battlefield for both sides. The Cybertrons had moved their Metrobase headquarters to the foot of Mount St. Hillary, taking up a position to defend the ruins. Beaten to the punch, the Destron forces repeatedly attempted to invade the ruins through various schemes, or else attacked and plundered the humans’ energy bases and military installations, which were now short-handed thanks to the defense of the ruins. Then, one day, something happened. Just like they’d done the day before, the ruins investigation team of Joe, Crushbull and Converter was unearthing a lifepod in the middle of a Destron attack. This pod, however, emitted a mysterious energy plasma radiation, temporarily rendering all Micromaster warriors nonfunctional. “We have readings of a dimensional displacement in the skies over the base,” San Diego reported. “Could it be an analogue to the dimensional vibrations that once washed over us…?” Sireen responded to Alan’s report, though it was hardly an answer. The command room sank into silence, silence which was shattered when the invasion alarm siren resounded. The base’s auto-sensors lit up the invader—a pitch-black jet was raiding from the skies above. From the jet came a word with which they were all familiar: “Transform!” A single robot made a graceful landing. “I am Wing, a Cybertron Transformer.” As he spoke, vivid coloration surfaced on his body. “A stealth mode? Isn’t that a new Destron combat power?” Spark’s doubts were only natural. Wing responded to Diego’s question: “We did indeed come from Seibertron, but it seems we’ve somehow arrived on a different world. This IS Earth, isn’t it…?” He gazed at Mount St. Hillary. “We?” Desire had not missed that key word. “Yes, all six of us in the Multiforce…” As Wing spoke, the empty space on either side of him distorted, and the forms of five robots appeared. “Disengage Stealth Mode.” As had happened with Wing, their black bodies shifted to being brightly colored. “Let me introduce–” But a siren cut off Wing’s words. It was the emergency alert. “Okay, let’s save the introductions for after we’ve sent these Destrons packing. 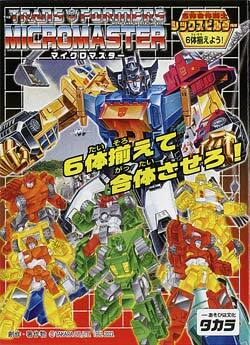 Transform!” The six robots split up into three groups, then one of each group became a top or bottom body half. The paired halves then combined and took off. Time seemed to stop for the Micromasters at the events of this moment. “Incredible!” Windy’s voice brought the Cybertron warriors back to their senses, and the battle began! True to their word, the members of the Multiforce repelled the Destron Build Team’s attack. Then Berserker Mode SixWing came charging in, burning with rage. As expected, the Multiforce struggled under the fierce assault. “Let me help.” SixTrain came running in. “We’re fine. And as long as we’re introducing ourselves, we’ll show you how we work together.” With this declaration, the three robots split into upper and lower halves, and then all six combined—the gestalt warrior Landcross was born. 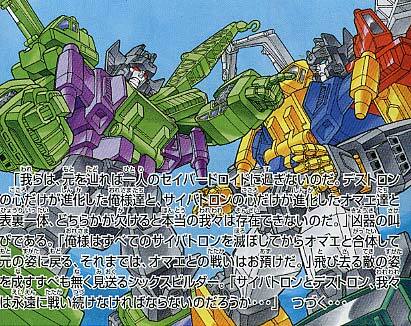 Landcross’ power, greater even than SixWing’s, forced the Destron Micromasters to withdraw. The battle was ended. “It seems that while we were testing this stealth equipment we’d developed on Earth, we passed through a dimensional rift and came to this Earth. Perhaps we were originally meant to intervene on this world,” Landcross murmured as he watched the Destrons’ retreat. “However, this world is rather different from the one I was on.” The Cybertrons had gained new allies, and their voices echoed from the foot the supposedly extinct volcano of Mount St. Hillary. The leader of the Liner Team and peacemaker of the Cybertron Micromasters. Contrary to his powerful outward appearance, he is a delicate logicalist. However, when his anger reaches its peak, not even his teammates can restrain his power. He is also an expert marksman. A self-style ninja warrior. Operating in darkness is his specialty, and when the battle stretches out for ages, this tough guy can take it. Wields the all-purpose machine “Wingard,” going into action on land, sea and air. Has a special ability to control darkness. Rather talkative for a self-styled ninja. A quiet warrior, more of a logicalist than Diego. Uses his skill at controlling electrical items. The Mega-techvolt he wields makes the Destrons shake in their foot casings. In the opinion of the always cool and gentlemanly NIGHT, Alan tends to fade into the background. A young warrior who prides himself on his speed. Among his team, he’s most compatible with Leif, and they often act in concert. Owing to his youth, he sometimes has his own way with matters and is something of a roughneck. Specializes in controlling water. A specialist in information analysis. Controlling his probe “Gripper,” he obtains all sorts of intelligence, analyzes it, and uses it to guide battles to his advantage. He’s a good sort, extremely sociable of character. His counseling abilities are outstanding, resolving the worries of many a Cybertron. Uses his skill at manipulating electricity. The leader of the Turbo Team, Road Police has a warm central processor and a strong sense of justice. A gun collector without equal, he enjoys accumulating Earth handguns, though he’s annoyed that they’re not the right size for him. A master of the fast draw, he’s the best of the Micromasters in short-range marksmanship. Among the Cybertrons, this warrior is known to be the happiest about their coming to Earth. When not in combat, he can usually be seen having fun tooling around, giving rides to Earthling females. He claims it’s all a part of his intelligence-gathering activities. Though he appears frivolous, make no mistake, this fighter’s got speed and strength in spades. Boasting of the highest speed of the Turbo Team, Circuit is often given reconnaissance and messenger missions thanks to his impressive scouting ability. Though unrivaled in driving technique, he is easily excited and often races around wildly. This has earned him frequent warnings from Road Police. Circuit has the special ability to converse with the wind(?). An aloof, nature-loving warrior, Neo-Wheel has little taste for following and participating in strategies with the rest of his team, save for those that require combining. If anything, he is often found in the wild amongst animals. He won’t say for sure himself, but he appears to have the special ability to communicate with the animals. Circuit is indeed a warrior of many mysteries. Contrary to her robust outward appearance, Discharge is a female Cybertron warrior. Few Cybertron fighters have seen her true appearance, as she is usually equipped in her heat-resistant armor. Devoting her passion to firefighting and rescue missions, Discharge really shines, no matter how she looks on the outside. She doesn’t enjoy aggressively participating in battle, but she can be rather scary when angered. As his appearance suggests, Sireen is a doctor who conducts the Cybertrons’ health care and medical treatment. The equipment over his head doesn’t store offensive weaponry, but rather various medical tools and devices so he can deal with all sorts of emergency repairs. He and Digo of the Liner Team are old friends, and the two of them work together as the “central processors” of the Micromasters for designing strategies. The Wing Team Leader. His high-performance hovering ability lets him transform freely in flight. His preferred tactic is to circle silently around behind his foe and then attack. “The surest way to defeat an enemy is from behind,” is his motto. Won the position of leadership by his strength. A schemer, he is the team’s tactical officer. Has high-performance stealth abilities. With his strategical instructions to his teammates, he can provide more precise orders than Chaingun. Harbors a strong rivalry with Diego of the Liner Team. Raker excels in outer space combat and can make atmospheric re-entry under his own power. He specializes in diving attacks from high altitudes. A real flirt, he has frequently fallen into crises through his relations with femmes. Loves beautiful objects, hates taking part in operations that get his frame dirty. Since he is always seeking beauty, even in attacks and destruction, he frequently conflicts with Chaingun over strategies. Prefers flying at high altitudes above the clouds so rain won’t get him wet. The kind who’s out to please everyone, Flanker specializes overall in attacking the weak from behind the protection of the strong. Always alternating in siding with either Chaingun or Supersonic, he actually views them both as beneath him. Secretly aiming to take the leader’s position for himself. The hardest worker on the Wing Team. Terse of speech, this soldier follows orders faithfully. However, he is also the only soldier among the Destrons to wonder why he evolved into a Destron and not a Cybertron, even as he continues fighting. A mighty robot boasting of his power. Puts strenuous effort into construction operations in combat, skillfully operating the shovel of which he’s so proud. The moodsetter of the Build Team, he devotes himself to the care of his teammates. His famous way of chairing recreational times is known even among the Destrons. A martial artist versed in all manner of hand-to-hand combat, Ironlift is very agile and specializes in work at high altitudes. He has excellent jumping power, and rumor has it that, leaping about from building to building, he’s more ninja-like than the ninja-esque Night. The laugh-master(?) of the Build Team, Gran-Arm makes use of his tight-turning vehicular mode to charge through the battlefield. While his offensive ability is low compared to the other five, his bulky armor ranks him high on the team in defensive power. At times he has teamed up with Digger to perform on TV shows. Destron soldiers fear this taciturn ‘bot’s great fighting strength. Spark and Lief adore him like a big brother. Apparently, long ago, he incurred a debt to Crush-Bull that he could never repay and now serves him loyally. Just like Road Police, Mixing is quite the gun-nut. His knowledge of weaponry is second to none, and his hobby is modifying Earth weaponry for his own use. On the other hand, he is also quite a pacifist(? ), and it’s his pet theory that once all the guns are his, no one could wage war any more. The gestalt robot completed when the six members of the Build Team combine. 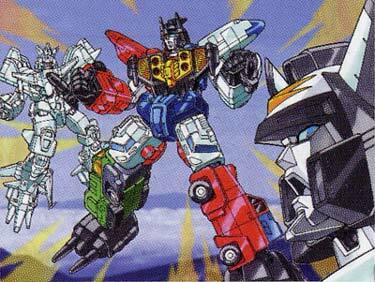 Boasts of the greatest strength among the Micromasters. Though they thoroughly display this power in their fighting strength, they actually want to use their abilities for creation rather than destruction. The Train Team leader. Has an uncrushably strong will and righteous spirit. 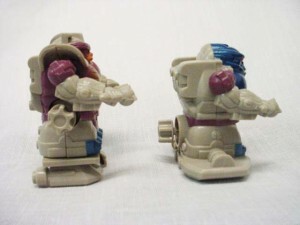 Despite losing his memories from before he evolved into a Micromaster, he was chosen as leader owing to his high popularity among his teammates. With a greater hatred for evil than anyone else on the team, he appears to be grasping for both the lost memories of his past and the key to activating his Red Mode. A martial artist with a supreme love of karate, Atlan’s hobby is hardening his body. He enjoys special training and never forgets to drill. The intensity of his paired training with Ironlift fascinates all who see it, drawing them in and not letting them go. The strength of SixTrain’s punching power can only be due to his combining with the team. Possessing a precognitive ability, Raise has saved his teammates from tight spots countless times. Though he says very little, the accurate decisions he makes using his ability earn immense trust from his partners. A very early riser, he loves to watch the sun rise over the ocean. An engineer by nature, he busies himself daily with the maintenance of their Metrobase headquarters. With the help of the Build Team, he endeavors to power up the Cybertrons with the new items he produces in rapid succession. Deeply impressed by Earth culture, he’s had an episode in which he was going to hold a wedding ceremony with Discharge. Though a splendid female warrior, in fact, her mental age approximates that of an Earthling teenage girl, and she is engrossed more with love and gossip than battle. With her beautiful singing voice, she’s the idol of the Cybertrons. She even seems to have secret admirers among the Destrons. A historian, he is interested in Earth’s history and devotes himself to research centered on ruins around the world. Extremely well-versed in Cybertronian history, he will offer advice to his companions using historical facts as examples. Though he affects a youthful air, he is the oldest of the Micromaster warriors. 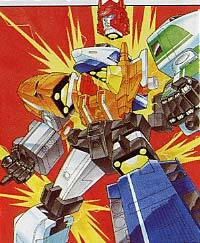 A combiner robot born of the fusion of the six members of the Train Team. Though his Red Mode, which turns his whole body crimson when he activates it, lasts only a short time, it boasts of the greatest power of any of the Micromaster gestalt warriors. As mild a team as they normally are, no one can hide their surprise at the complete change to them in Red Mode. A strong sense of responsibility, as leader of the Multiforce, he brings the team together. Under Commander Star Saber, he was assigned the defense of the solar system district, but in response to the recent accident, he has resolved to fight alongside the Micromasters. Waver loves children, and during his free time, he goes cruising on the lake, giving rides to them. His abundant knowledge proves most useful in his role as Wing’s adviser. As he was the central figure in the stealth experiments, he feels responsible for the current accident. Focusing on the highways, he mixes in with other cars and gathers intelligence on the Destrons. He has really taken to his Stealth Mode, and has made headlines as the “Ghost Super Car” from his habit of disappearing as he races along. Amply learned in things military, he is well-versed in combat tactics, serving as the Multiforce’s strategist. Considering his fear of changing history with the recent accident, it is most interesting that it was Tacker who proposed contact with the Micromasters. Though he can be quick to fight, this warrior is gentle towards his teammates. Among the team, he is especially good friends with Tackle. When Windy pointed this out, Mach revealed a past episode in which the two of them had a major brawl, and he and the Micromasters rapidly became friends. With his love of things like mountain climbing and camping and with his hobby of fishing, this warrior has a real taste for the outdoors. A survivalist fighter, he can combat on just about any kind of battlefield. Among the team, he seems to work best with Mach, and even in vertical combination, he seems to combine more often with Mach. Featuring CG versions of 2 of my favorite all time ‘flip-changers’ Optimus (Batimus) Primal and Megatron aka Megalligator. 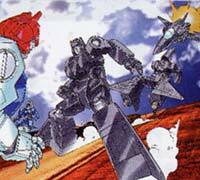 Quite possibly one of the oldest Beast Wars commercials? 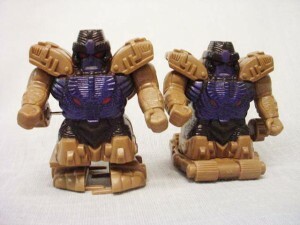 Taken from the CD-Rom included in the Takara Transformers Beast Wars VS-S1 release.